These inline couplers connect two modular cables. They are wired straight through rather than crossed over. In other words, they are wired 1:1 (Pin 1 to Pin1, Pin 2 to Pin 2, etc). Each end of the adapter consists of a female connector and thus can be used to couple two male cables. 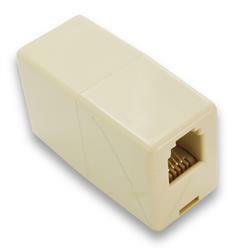 Several connector varieties are available: 4P4C (RJ-9), 6P6C (RJ11/RJ12/RJ14), 8P8C (RJ45), 10P10C (RJ50), and shielded 10P10C (RJ50). All options are pictured above. Note: RJ45 (8P8C) connectors have eight pins, whereas RJ50 (10P10C) connectors are the same physical size, but with 10 pins. RJ50/10P10C is sometimes erroneously referred to as "RJ45 10 pin." We now offer panel-mount coupler options. These are particularly useful when a thru-panel cable connection is needed. For more detailed information on these products, see the specific product page links below.